Everyone’s favorite volcanic snail returns again, this time getting the GX treatment! So you know…let’s take a look. Magcargo-GX is a Stage 1 Fire Pokemon-GX, 210 HP, with a Water Weakness, no Resistance, and a Retreat Cost of 3. Crash Charge is its Ability, letting you mill off the top card of your deck, and if it’s an Energy, you can attach it to whomever you like. Lave Flow is a 3-for-50 that lets you discard Energy off of Magcargo-GX, letting him deal out 50 more damage for each one shoved off this way, and finally Magburn GX costs only 1 Energy and has the simple effect of milling off the top 5 cards of your opponent’s deck. I feel like the most appealing aspect is Crash Charge, as with enough Energy in your deck, you can thin it out and power up your Pokemon at the same time. This is particularly useful with something like Blacephalon-GX, who can then use the Fire Energy for its own attack, though it can grab Fire Energy from any of your Pokemon and put it into the Lost Zone. Otherwise, I’m not sure of the rest of Magcargo-GX. 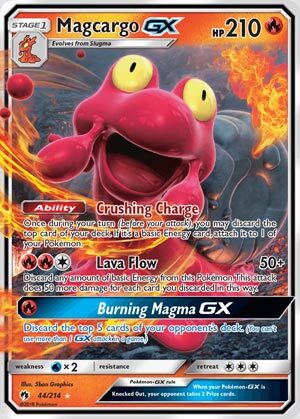 Lava Flow does synergize with Crash Charge, though it only affects Magcargo-GX, and Magburn GX can sometimes help your opponent more than hinder them. Unless it’s the last 5 cards of their deck or so, but at that point, you’ve more than likely used another GX Attack to beat them faster. Definitely bound to see play for Crash Charge, that’s for sure. And he’s at least not vulnerable to typical Bench attacks, having 210 HP! Next Time: Charge things up for more power! Ninth place in our Top 11 countdown is Magcargo-GX (SM – Lost Thunder 44/214, 198/214, 218/214). If you’re not familiar with our countdowns at all, you can find an explanation here. If you’re wondering why we did a Top 11 this time, we had some… interesting results that will be made clear when we get to number one. Getting back to Magcargo-GX, it is a Stage 1 [R] Type Pokémon-GX with 210 HP, [W] Weakness, no Resistance, Retreat Cost [CCC], the Ability “Crushing Charge”, the regular attack “Lava Flow”, and the GX-attack “Burning Magma-GX”. Crushing Charge is a typical activated Ability; once during your turn (per copy), before attacking (or ending your turn), you can discard the top card of your deck. If the discarded card is a basic Energy card, you then attach it to one of your Pokémon in play (your choice). Lava Flow requires [RRC] and does 50 damage while letting you discard as many Energy attached to Magcargo-GX (or if copied, whatever is using the attack). Each Energy discarded in this manner is worth an additional 50 damage. Burning Magma-GX only requires [R] and it lets you discard the top five cards of your opponent’s deck. So, what does all that mean? Being a Pokémon-GX means giving up an extra Prize when KO’d and dealing with the finally maturing anti-Pokémon-GX effects, like Choice Band, Shrine of Punishment, and others. There are a few cards which actually reward something for being a Pokémon-GX, and I don’t just mean Expanded Format cards that weren’t “future proof”. Being a [R] Type is solid in terms of Weakness exploitation and doesn’t have to worry about Resistance. Both the Pokémon Type and the Energy Type have some solid support, ranging from good to great (especially when we include the Expanded Format). There are a few anti-[R] effects to worry about such as one side of Parallel City subtracting 20 from the damage done by the attacks of [R] Types ([G] and [W] Types, too)… which is opposite the Bench-shrinking side for which decks actually run Parallel City. 210 HP is fairly sturdy; OHKO’s take some doing. [W] Weakness is bad but not the worst right now, lack of Resistance is the worst but not really that bad because Resistance isn’t as dramatic as Weakness and most cards lack Resistance anyway. The Retreat Cost of [CCC] is mostly bad; Magcargo-GX is a pain to get out of the Active spot if you didn’t want it there, though this does make the card Heavy Ball legal… which on rare occasions actually does matter. Crushing Charge is the main reason to run Magcargo-GX because this kind of Energy acceleration via Ability should be worth it in at least a few decks. I’m telling you now, combo this with an effect that allows you to see or even control the top card of your deck, and it’s pretty sweet. Also, remember that you aren’t restricted to a particular Type of basic Energy; your options are fairly open for what you can partner with Magcargo-GX. Even Lava Flow isn’t 100% [R] exclusive; you need to meet the specifics of the printed Energy cost, but the discard costs just need to be some kind of basic Energy. 50-for three is terrible. 100-for-three-and-a-discard is a little subpar. 150-for-three-and-a-double-discard is decent. 200-for-three-and-a-triple-discard starts becoming less impressive again… but that ignoring those times when it (or higher discard amounts) secure an important KO or simply aren’t wasteful because you know Magcargo-GX is about to be KO’d, losing its attached Energy anyway. Burning Magma-GX would be amazing if it wasn’t a GX-attack, and is still pretty nice as one. If you like to save your GX-attack as a game finisher and have at least a single source of [R] Energy in your deck, you can try to discard something important early or mid-game, or just wait until late game and maybe even win via deck out! Magcargo-GX has a pretty obvious combo partner, assuming one can make room for a split Stage 1 line: Magcargo (SM – Celestial Storm 24/168). It’s “Smooth Over” Ability means one Crushing Charge per turn hits the exact Energy card desired. Smooth Over is actually once-per-turn-per-copy, so if you’ve got two each of Magcargo-GX and Magcargo, you could guarantee any two basic Energy in a turn, without using your manual Energy attachment! If you want to focus on just Magcargo-GX, there are other options to stack the top of your deck, though none with both the range and reusability of Smooth Over. A deck can focus on Magcargo-GX or use it in conjunction with something else. While Crushing Charge would obviously be better if it worked on Special Energy in addition to Basic Energy, that would be really crazy given Smooth Over is a thing even in Standard. Even without it, attackers which normally rely on Special Energy may not need to; any two basic Energy can replace one Double Colorless Energy, while a deck only running Rainbow energy for one or two attackers might just replace it with the needed, off-type basic Energy. In Japan, we’ve got at least one example of Magcargo-GX being slipped into Zoroark-GX control deck and one example of it being a deck’s main attacker, the former in the Top 16 and the latter still in the Top 32. Interestingly, the Zororoark-GX approach just ran a single Magcargo-GX with no basic Energy cards, just a single Rainbow Energy… which almost certainly means it was included for the GX-attack and nothing else (the deck also ran the Smooth Over Magcargo). As is typically the case, Magcargo-GX faces more competition and counters in Expanded, but also more opportunities. A must run in the Limited Format unless you pull a basic Pokémon-GX worth running all by itself. If you don’t have any other use for [R] Energy, or even if you can’t fit any basic Fire Energy into your deck, just run it for the Ability. If you can feed the flames, even better! Magcargo-GX doesn’t seem like it is going to be as big a deal as I thought it would be way back when I first saw it, but it still looks like a good card for its stats and its effects. Thanks to the regular Magcargo having a place in many decks, you may be able to catch an opponent entirely off-guard with Magcargo-GX. So after baby Magcargo made it on the top 10 cards of Celestial Storm, we have another Magcargo card on another top 10, this time, the GX counterpart taking 9th place. And looking at that card, it’s easy to see why. It has an ability that provides energy acceleration…provides the top card does contain a basic energy. If it’s not, then you just wasted a card depending on how you look at it. Cards from the discard can be recovered, though mostly unconventional methods – perhaps the hardest category to recover stuff is item cards, followed by Stadium cards. One might wonder how to actually get a basic energy to be put on the top card of your deck. One of the answers would be Mallow, in which she lets you pick two cards from your deck and put them on top of your deck. Another answer would be using the non-GX from Celestial Storm. Smooth Over lets you pick any card from your deck and put that on top of your deck. With both the GX and the non-GX, you can guarantee yourself a basic energy. This seems like you can use a 4-2/2 split, which can give you two extra attachments at best. It’s also the same as using a single Mallow and have 2-2 line. Magcargo GX does have an attack that can benefit from both abilities from the same evolutionary line. Lava Flow costs RRC for 50 damage, plus 50 more damage for each basic energy cards that you discarded. Discarding the minimum of RRR makes it 200 damage, while RRRR allows it to OHKO anything in the game. Magma Burn GX is somewhat of an afterthought after having a good attack, costing R just to discard the top 5 cards of your opponent’s deck…which could make you win by deck out. Overall, this Pokemon does a good job of supporting other Pokémon and even itself. Magcargo GX (LOT 44) blazes a trail into the Pokemon Trading Card Game from the Lost Thunder expansion set. This Stage 1 Fire Type Pokemon has 210 HP, an ability, and two attacks. Its ability, Crushing Charge, allows you to discard the top card of your deck and, if it’s a Basic energy card, attach it to any one of your Pokemon. And that’s any Basic energy, not just Fire. Obviously, this synergizes well with baby Magcargo from Celestial Storm. Smooth Over a Basic energy to the top of the deck and then attach it to any of your Pokemon. If you’re fortunate enough to get two Big Daddy Fire Snails and two Baby Mags in play, you could do this twice, meaning you could attach three energy cards per turn. Definitely some good acceleration there! But you need acceleration like that for Magcargo’s main attack Lava Flow. Lava Flow does fifty damage PLUS fifty more damage for each Basic energy discarded from your attacking Magcargo GX. It’s very similar to Blacephelon GX and Turtonator (DRM), but the energy has to be discarded from your Magcargo GX in the active. Still with Kiawe, Crushing Charge, maybe Dragon’s Wish Dragonair (SUM) and Fiery Flint, you can do some damage with Magcargo Squared (I heard one youtuber refer to this Magcargo GX baby Magcargo archetype by that moniker). Burning Magma is Big Daddy Magcargo’s GX attack. For a single Fire energy, you can discard the top five cards from your opponent’s deck. It’s potentially a decent attack, and it might find itself a niche in some mill deck in the future. Overall, this isn’t a bad card, and I look forward to trying it out at some point, I just only pulled one so far and simply have had other decks I wanted to try out first. I really love how many different ideas for decks there are right now. There are just so many different decks I want to build I just don’t have time.. I don’t know about a quad Magcargo build, but I’m actually thinking about trying it with White Kyurem (LOT 63). It might also make Electivire (LOT 72) or Turtonator (DRM) more realistic as well.